However, the Pennywise redesign caught my attention in a big way. The previous Pennywise label was okay. Reminiscent of a postage stamp in style and size, the wine’s vintage was “stamped” onto the labels, which were consistent across the brand save for differences in color. Enter the new label featuring San Francisco’s historic U.S. Mint. The label looks like a stock certificate; although there’s a nod to the old penny with a dim image of it, the new label drips with the impression of strength and something valuable. So how was this Cabernet Sauvignon? Excellent! 15,000 cases were produced of this 76% Cabernet Sauvignon/17% Sirah/7% Merlot. The grapes were sourced 44% from Northern Interior Valley, 42% from Paso Robles, and 14% from Lodi. With a deep color, the wine’s complexity is explained by the blend. Sirah brought in delicious aromas and high notes. This Cab isn’t as jammy and thickly textured as many of the California big boys are. I get French oak, a hint of anise on the back of the palate, bing cherries, and a little bit of pipe tobacco. 13.5% ABV, $8.98 and up. An extreme bargain at this price. This entry was posted in Cabernet Sauvignon, California, Merlot, News, Syrah/Shiraz. Bookmark the permalink. I couldn’t disagree with you more. 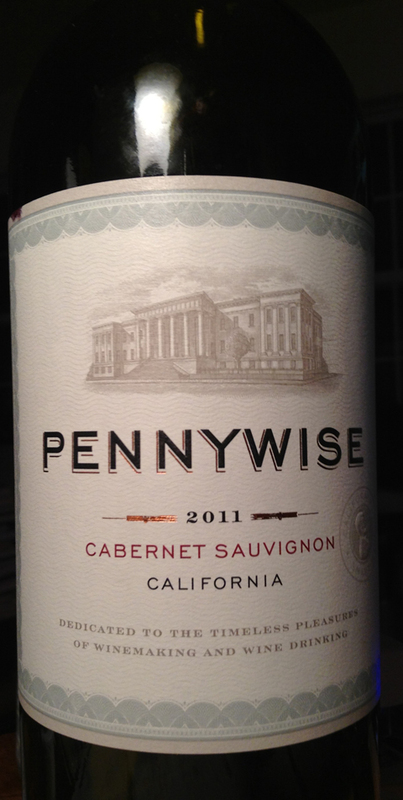 The new pennywise label is generic at best, & does not stand out what so ever on retail shelf nor a back-bar. The old label on the other hand had a unique look unlike any other, & the affordable/solid juice stood firmly behind it. 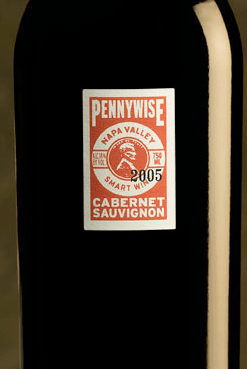 i too dislike the new labels…part of the reason i gave Pennywise a try in the first place was the unique and interesting label. now i pass by it even when I’m looking for it. Do any of you still have a bottle left with the old label? I’m from Denmark, and we can only buy Pennywise one place. I love Pennywise Cabernet Sauvignon, but when my local wine man got the new bottles, I didn’t have any left with the old label. I would like one for collection, simply because that’s the reason I tried it in the first place. My friend is going to New York next month, and if any of you know a place to buy the wine with the old label, I would be very happy.